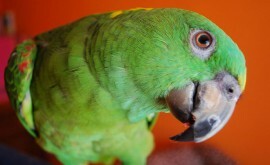 A common complaint I hear from large parrot owners is the screaming. If you are thinking about buying a bird, it is important to understand that birds scream. In some cases, their voices can be heard up to a 3 mile radius, that’s very loud inside of a house or apartment by anyone’s standards. Some of this vocalization is perfectly normal and healthy but it can also indicate a sick or unhappy bird. I usually tell people to expect a flock squawk in the morning and at sunset but an all day screamer requires some investigating why. Identify the reason for screaming. This could be the result of a bored or lonely bird. In this case, spending more one-on-one time would help. 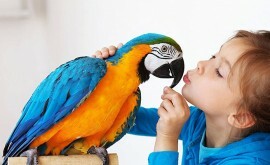 Experts recommend loving and playing with the bird only when he is not screaming so the habit is not being enforced. Never run to the cage or his side to shush the bird as will enable or reward the screaming. Birds will also scream when they anticipate something. For instance, many people will yell for a bird to be quiet, which is then anticipated. In this case, the bird uses screaming as manipulation for getting attention. Again, he should be given attention when quiet opposed to times of screaming. Some birds recognize owners get mad when they scream. As the owner screams, the bird screams back. Even though yelling seems like a normal response, it is important to remain calm and walk away. If needed, the door to the bird’s room can be closed or a sheet placed over the cage for a short period of time, NOT all day. Noise level in the home can also lead to a bird screaming. For instance, if a television or radio is up loud, or kids are running around making a lot of noise, a parrot may simply join in or scream to be heard over the noise. Try reducing the noise level in the home as much as possible or during the more intense times, shut the door to the bird’s room. Birds will also scream when looking for a mate. Remember, parrots have one mate they are completely dedicated to so if a bird lives alone in a cage, he might simply be lonely. Again, attention in a calm environment will help. If you need a quick fix for a screaming bird, cover the cage with a sheet. Usually, this is only a temporary solution to stop the noise, not a method that will teach a bird to stop screaming or prevent future screaming. This should not be used out of laziness or a “go-to” method because they will just become resentful and then you’ll have other issues to deal with along with the screaming. Covering the cage is just to give the bird some down time if there has been a lot of chaos in his environment. Again, it’s a brief time out. Another suggestion is offering them a hut or a panel to hide behind. Birds are vocal creatures in general some with louder voices than others just like us humans. We have all been next to the person on the plane or bus that is blowing out your eardrums and they aren’t even sitting directly in front of you, it’s just some people’s personality or nature. 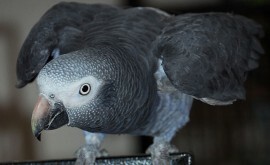 We all (human or animal), vocalize to communicate with each other so take the time to find out what your parrot is saying to you before you quit your “vocal” feathered companion.